This page explains how to travel by train or ferry from Vilnius to other European cities. Click here to buy tickets starting in another city. Vilnius to Kaunas (104 km) takes between 1h05 & 1h42, up to 15 trains daily, fare €4.63 by regular train or €5.21 on an express, 1st class costs less than €1 more. Vilnius to Klaipeda (376 km) takes around 4h40, departures from Vilnius at 06:45, 11:30 & 17:40, fare about €14.45. Departures from Klaipeda at 06:50, 12:15 & 17:05. Check times at www.traukiniobilietas.lt, select EN at top right. Hopefully in a few years time the new Rail Baltica project will make this a routine journey by fast direct train. But in the meantime it is indeed possible to make this journey by train via Riga, if you want to avoid a lengthy journey in a long-distance bus. Day 1, travel by train from Vilnius to Riga via Daugavpils, see the Vilnius to Riga page. Day 1, travel by train from Riga to Tallinn, see the Riga to Tallinn page. Step 1, travel from Vilnius to Riga as shown above. Step 2, an excellent overnight ferry links Tallinn with Stockholm every night with a range of comfortable cabins, bars, restaurants. For times, fares & online tickets see www.tallinksilja.com. Step 1, travel from Vilnius to Riga to Tallinn as shown above. Step 2, take a ferry from Tallinn to Helsinki. Several ferry companies operate both conventional ships (2½ hours) & fast ferries(1½ hours) from Tallinn to Helsinki. Services run daily. For times, fares & online tickets see www.tallinksilja.com, Eckero Line & Linda Line. Hopefully in a few years time the new Rail Baltica project will make this a routine journey by fast direct train. 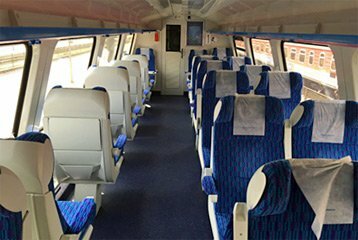 But in the meantime it is indeed possible to make this journey by comfortable air-conditioned train via Kaunas & Bialystok, at least several days per week, avoiding a lengthy journey in a long-distance bus. 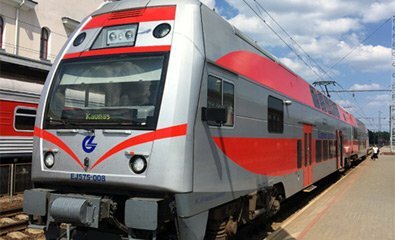 There are three daily direct trains from Vilnius to Minsk, using modern air-conditioned electric trains either owned by Belarus Railways or Lithuanian Railways. Journey time between 2h38 & 2h55. You go through passport control before bearding, boarding ceases 10 minutes before departure. Feedback would be appreciated. Fare around €17 in 2nd class or €30 in 1st class. You can check times & buy tickets online for at least two of these three trains at the Lithuanian Railways website www.traukiniobilietas.lt. You can buy tickets in either direction, they are issued as e-tickets which must be printed out. Tip: Minsk can be written Minskas in Lithuanian. There used to be an overnight sleeper train from Vilnius to St Petersburg with 2-berth & 4-berth sleepers which did not go through Belarus. Unfortunately, this train was discontinued in 2015. Step 2, a comfortable sleeper train runs from Riga to St Petersburg as shown here. It doesn't pass through any part of Belarus. There is a daily sleeper train from Vilnius to Moscow leaving Vilnius around 19:10 and arriving Moscow Byelorusski around 09:10 next morning. You can check times at the Russian Railways website www.rzd.ru - see my advice on using it here and note that you can't buy tickets from rzd.ru for this train in this direction, as tickets must be collected from a Russian station. The train has 2-berth sleepers & 4-berth sleepers. This train passes through Belarus, so a Belarus transit visa is needed. The fare is around €50 in a 4-bed sleeper if you buy at the ticket office. To check train times and book online in either direction, use the Real Russia booking system here. Real Russia charge a mark-up over ticket office prices, included in the prices they show. For journeys starting in Vilnius you'll need to have tickets sent to you (at a small extra charge) as the e-ticket option doesn't work for departure from Vilnius, only for departure from Moscow. Step 2, take the Latvijas Express overnight sleeper train from Riga to Moscow as shown here. This does not go through any part of Belarus. Step 2, take the comfortable overnight ferry with cabins available from Riga to Stockholm as explained above. and transfer by taxi, bus or metro to Stockholm Central station. Step 3, take a train from Stockholm Central to Oslo, Copenhagen, Gothenburg, Malmo or anywhere else in Sweden, Denmark or Norway. You'll find more detail on the Trains from Stockholm page. Step 1, travel from Vilnius to Warsaw as explained above. Step 2, travel from Warsaw to anywhere in central & western Europe as explained on the Trains from Warsaw page. For Vilnius to London, see the London-Vilnius page as this covers travel in both directions. You might also consider taking the ferry to Stockholm, train to Copenhagen, and onward train to Hamburg, Amsterdam, and so on. See the ferry to Stockholm section above, then see the Trains from Stockholm page.